In 2009, Mark Mykleby, a Marine colonel, was summoned to the Pentagon along with a fellow officer and charged with a seemingly impossible task: to create a new national grand strategy for America. They developed a paper - later published by the Wilson Center as the National Strategic Narrative - that posited economic sustainability, not weapons systems, terrorism or the next war, is the key to America's successful path forward in the 21st century. For the first time, the Pentagon publicly recognised that America's prosperity and global influence depends not on our investment in military defense, but in our domestic future. The good news? For the first time since the end of WWII, demographic trends and advances in housing, transportation, farming, and resource utilisation are aligned and together offer power great enough to effect systemic change. Things like walkable communities, regenerative agriculture, and resource productivity can be our saving grace. We can still do something - if we act fast. 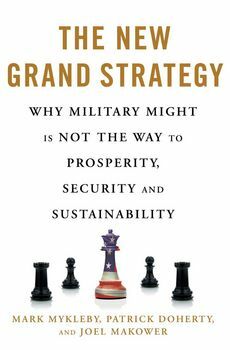 In The New Grand Strategy, Mykleby joins Patrick Doherty, a national security expert at the New America, and Joel Makower, an award-winning journalist focusing on corporate sustainability strategy, to expand the original grand strategy paper for a popular audience. They believe firmly that we have the fuel to restore prosperity, competitiveness, fiscal discipline, and security for generations to come - if only we'd use it. The author of the Wilson Center's "Grand Strategy Project" reveals his plan to put American citizens back to work - creating wealth instead of debt, and leading the transition to sustainability.